Here’s our guide to the best of what’s on in and around Greater Manchester this weekend plus some suggestions from our social followers. A family-friendly Sunday of music, food and theatre celebrating Manchester’s newest neighbourhood. The largest children’s festival in the North West – with hundreds of activities for children aged from two to twelve and a host of popular characters like CBeebies’ Mr Bloom. Take an entertaining and informative tour on an open-top bus, visit the landmarks and enjoy the Saturday sunshine. The event will remain shrouded in mystery until the audience step inside the big top, but families can expect spellbinding theatre, circus, music and visual trickery. Decked with flowers, picket fencing and patio chairs The Spring Festival of Markets is the perfect destination for a bite to eat, after-work drinks and meeting with friends. @cffuk: #HOMEwarming festivities at the newly opened @HOME_mcr ! Emirates Old Trafford – Conference and Events: Watch Lancashire County Cricket Club in the NatWest T20 blast tonight with music from Reverend and the Makers! Mark Lupton: Places on Red Rose Forest’s Heritage Trees walk at Broomwood in Timperley, Trafford 10am tomorrow, FREE! http://www.redroseforest.co.uk/web/content/view/34/850/ Call Janie on (0161) 872 1660 to book. Learn more about our local special trees. Marina Robertson: See Take That in concert!!!!! Peter A Wilcox: HOME warming weekend! This entry was posted in Bury, Events, Family, Food & Drink, Manchester, Music, News, Salford, Shopping, Spring, Theatre, What to do and tagged bank holiday in manchester, family events, manchester, things to do, what to do on May 22, 2015 by Elizabeth Kelly. Here’s our highlights of where to be and what to see in Manchester this April. The monumental stone statues of Easter Island are some of the most widely recognised archaeological objects in the world. This exhibition will deconstruct some of the myths about the island, and discuss current theories about the decline of this astonishing culture, showing one of the statues, Moai Hava, which was collected from Rapa Nui in 1868. Emily Allchurch uses photography to recreate old master paintings and prints, creating contemporary narratives. The complex photographic images have a resonance with place, history and culture and deal with the passage of time and the changes to a landscape, fusing contemporary life with a sense of history. This annual festival will have live music featuring ‘The Revolutionaires’, DJ sets from ‘Katz Korner’ & ‘Gypsy John’, vintage stalls and cars, swing dance classes and much more! The event is also free entry for all. In the Easter School Holidays, the 2015 foodie festival will incorporate the popular Stonyhurst Spring Fair, so along with great foodie stalls, inside you will find lots of gift and household items. The perfect recipe for a fun, foodie day out for the whole family. Chicago hip-hop brass band Hypnotic Brass Ensemble are an eight-strong cohort of horn-playing brothers. Together, they have formed a formidable reputation as one of the best live bands around, with a sound that calls to mind traditional New Orleans big-band jazz, rap, funk and hip-hop. Two of music’s most iconic singer songwriters will perform some of their best-known songs together including Boy In The Bubble, Fields of Gold,Driven To Tears, Mother & Child Reunion, Desert Rose, Every Breath You Take, The Boxer, Diamonds On The Soles of Her Shoes and more. A premium 5k night run and festival jam packed with music, food, drink and entertainment. Experience Manchester in a new light alongside thousands of others. There is a whole host of activity set to take place across the area, to entertain the thousands of families that come down to watch their rubber ducks race along the Spinningfields stretch of the River Irwell. Now in its sixth year, it costs just £1 to enter a racing duck. Ducks can be purchased online at ticketsource.co.uk, with all proceeds going to local children’s charity Brainwave. No film has captured the hearts of a generation like Dirty Dancing. Relive the passion, indulge in the romance and celebrate the greatest movie soundtrack of all time. Take a trip back to the summer of ’63, relive Patrick Swayze and Jennifer Grey’s sizzling performance in the ultimate coming of age romance. Over the past 10 years, Jimmy Carr earned his place amongst the very best of British comics. He brings his latest show ‘Funny Business’ to the O2 Apollo for one night only this April. Judgement Night, the season’s ninth league night, will see the stars go head-to-head for the decisive final fixtures before the bottom two players are eliminated. Watch the best in BMX face off in front of adrenalin fuelled crowds looking to watch riders jostle to qualify for Sunday’s finals in three rounds of motos. So you enjoy challenges and solving puzzles? Looking for a challenging yet fun activity to unwind with your mates or family? Take things up a notch as you work together to work your way out from the Escape Rooms. This entry was posted in Bolton, Bury, Events, Family, Food & Drink, Manchester, Music, News, Offers, Sport, Spring, What to do and tagged april in manchester, easter, family events, spring in manchester, stuff to do, things to do, what's on on March 26, 2015 by Elizabeth Kelly. Here’s our guide to the best of what’s on in and around Greater Manchester this weekend plus some suggestions from our social followers. 新年快乐 Xīnnián kuàilè Happy Chinese New Year folks! Head to Manchester for the festival that marks the start of a new lunar year in China, the city centre will be buzzing with performances, food and workshops. On Sunday the famous dragon parade will sweep through Chinatown from 12:30pm so make sure you arrive early to get a good view. A perfect day out for the kids, MOSI’s half term spectacular is running throughout the weekend. Get messy at a goo making workshop or enjoy the fun of the fair at the Victorian playground, you can even make your own glass microscope. Witness the transformation of ordinary objects into something compelling and extraordinary. Cornelia Parker’s self titled exhibition brings together work from her career and two important new commissions. @kerbsidemedia: Get on down to @NorthernSoulMcr and get a cheese fix. What else is there to do of a weekend? @placefishface: I agree, this is a definite MUST!! Great tunes , great vibes. Sarah Bleasdale: Look at getting free tickets to watch tv shows being made at media city can’t get better value than free! Chris Terry: Go and visit the Whitworth Art Gallery! It’s beautiful! Katie Hartley: Newly opened Whitworth Art gallery, China town, cocktails at cloud 23. Victoria Jackson: Definitely the West Didsbury makers market it’s awesome https://www.facebook.com/MakersMaket/posts/944248282281535 Excitement is building in Market HQ today! Only 2 more sleeps before we return to the fabulous and amazingly awesome West Didsbury! Silvia Rovegno Malharin: Visiting MOSI is always a great idea!! This entry was posted in Events, Family, Food & Drink, Manchester, Music, News, Offers, Spring, What to do and tagged Chinese New Year, family, half term, manchester, mosi, things to do, weekend in manchester, Whitworth on February 20, 2015 by Elizabeth Kelly. Here’s our highlights of where to be and what to see in Manchester this December. Explore the role football played at home and on the Western front during the war years and take a closer look at the brave soldiers who served their club and country a century ago. The biggest collection of BAFTA-winning actor portraiture ever assembled, comes to The Lowry for its first time out of London. Featuring portraits of over one hundred international stars. 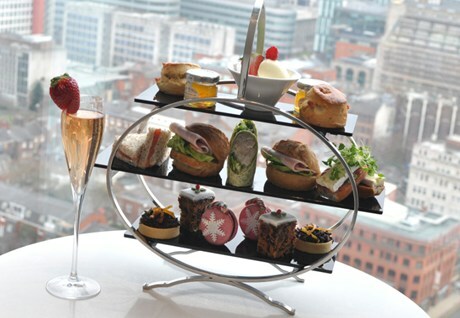 Indulge in a selection of festive inspired delights, such as: spiced dark chocolate Sorter torte, mixed fruit cinnamon scones and rum and raisin macaroons, with friends, family or loved ones while enjoying the best view in Manchester. The perfect pre-Christmas celebration for the whole family. Enjoy a traditional 3 course lunch, a visit from Santa and friends and a Christmas panto to entertain guests. Based on the award-winning DreamWorks animation film, Shrek the Musical is a must-see show for all the family, bringing all the much-loved characters to life, live on stage, in an all-singing, all-dancing extravaganza. Based on the award winning novel by Mark Haddon and winner of seven Olivier Awards, this highly acclaimed National Theatre Production arrives at The Lowry as part of its first ever UK tour. The Royal Exchange Theatre’s Christmas show has arrived. A florist’s assistant becomes entangled with a bad-tempered carnivorous plant in this hilarious kooky sci-fi musical. The most successful R&B vocal group of all time, with over 60 million albums sold worldwide, are set to headline the Albert Hall for the closing performance of their UK tour. The Hallé’s annual Carol Concerts are a seasonal spectacular not to be missed. This fantastic programme is packed full of wonderful choral music, showcasing the talents of both the Hallé’s family of choirs and those in the audience. Ennio Morricone, the most prolific composer in the history of film music, will be performing the greatest works from his career that spans over 50 years with a 160 member symphony orchestra and polyphonic choir. Take a trip to Tatton’s Nutcracker Mansion where all the best scenes from the famous ballet are recreated with glittering decorations, fresh garlands and festive baked treats prepared by costumed guides. Santa will be waiting to greet you in his fabulous Manchester Arndale Christmas tree star grotto this season, so to make sure you’re not disappointed on the big day, go give him your Christmas wishes. Make Christmas even more magical with an unforgettable night time journey through Chester Zoo. Experience the magic of a Weatherfield Christmas. A stunning tree and the sound of carols will fill the air, while snow covered roof tops will guarantee a white Christmas. Within the classic, ornate architecture of Deansgate’s Elliot House, new Italian restaurant, Gusto, combines timeless elegance and glamour, with heritage and style that can only be ‘made in Manchester’. This entry was posted in Christmas, Events, Family, Food & Drink, Manchester Districts, News, Offers, Salford, Shopping, What to do and tagged christmas in manchester, events in manchester, things to do on December 1, 2014 by Elizabeth Kelly. At the start of 2013, John Shinnick, a Manchester photographer, set out to document the people using a local, city centre bus stop. The people that he met in those brief interactions revealed a set of eye-opening stories. Having lived in over 10 cities in five different countries since childhood, Darius is greatly influenced by her experiences of different cultures. Her work explores her Chinese racial identity with modern styles, taking visual references from contemporary and street art. The annual taste extravaganza is back for the sixth year running, and this year visitors can expect some amazing additions to the ever popular two-day festival of chocolate heaven. With fairground rides, pirates and princess workshops, Little Fun Fest is a full day out for families with young children. Catch Cbeebies presenters Alex Winters, Cat Sandion and Dr Ranj along with Hagrid and Harry Potter in a big top circus tent throughout the day. This exciting experiential event provides baking enthusiasts with somewhere to learn and meet fellow bakers while offering an entertaining and inspiring day out for foodies and families alike. Every Friday night for 12 weeks Upper Campfield Market on Liverpool Road will be taken over by an incredible mix of music, food venues, street food and drinks. Part street food market, part drinks emporium, and part club, Friday Food Fight is bringing food rave to the city. From poet Wilfred Owen and Clement Attlee, who went on to become Prime Minister, to Victoria Cross recipients and remarkable first-hand accounts by civilians on the home front – the wartime lives of remarkable individuals are revealed through previously unpublished and rare personal items. Drawing upon more recent scientific discoveries about the relationships between living things, this new exhibition explores the place of war in nature, and the idea of a ‘struggle for existence’. Four years ago Elbow won the Mercury Music Prize for The Seldom Seen Kid, followed by a Brit Award for Best British Group and NME Award for Outstanding Contribution To British Music. Now they return to Manchester for a special show at the Phones 4u Arena to celebrate the release of their sixth studio album. From his hip-hop beginnings, DJ Yoda has evolved in the past 10 years, using his turntable skills and influences as diverse as funk, b-more, kuduro, reggae, drum ‘n’ bass and even big band swing and country & western, to make unashamed party music. Maria Aberg makes her Royal Exchange directing debut following recent acclaimed productions of As You Like It and King John for the RSC. Catch one of Shakespeare’s greatest comedies in the epic surroundings of Manchester’s Royal Exchange Theatre. Zoinks! Scooby-Doo and the gang are back by popular demand and with even more spooky mystery and fun. With hilarious physical comedy, popular tunes and special effects, this is fun for the whole family. This wonderfully funny and much loved farce is brought to life on stage once again – this time with a difference. See How They Run is the first theatre tour starring The Reduced Height Theatre Company and Warwick Davis, best known for his roles in Willow, Star Wars and the Harry Potter series. Nature comes alive in spring and the zoo can be a relaxing and inspiring place to be. Watch the fluttering of the butterflies, listen to the song of exotic birds in the awe-inspiring aviaries and notice the buds emerging in the award winning gardens. Journey along the Bridgewater Canal, Manchester Ship Canal and River Irwell listening to the expert commentary provided by the queen of canal tour guides, Salford-born Sue Grimditch. This new £1million French-style brasserie will launch at the start of April, serving up French classics like steak frites, tuna nicoise, moules marinieres and creme brulee. Kitchenette has been cleverly divided to provide a lively, stylish bar which leads into a light, airy dining area with views onto the canal, and outdoor terrace. This entry was posted in Events, Family, Food & Drink, Spring, What to do and tagged april events, april in manchester, festivals, manchester events, music manchester, night out manchester, things to do, things to do in manchester, what's on in Manchester on March 12, 2014 by Elizabeth Kelly. An exhibition curated by the elusive, enigmatic and uncompromisingly glamorous musician and style icon, Alison Goldfrapp. The performer gives the public a rare opportunity to explore some of her personal inspirations through the painters, film makers, illustrators and photographers who have shaped her own inimitable artistic vision. John Rylands Library hosts a range of festive activities for friends and family to enjoy together. This includes the Winter Fun Day (1 December), a Festive Makes Day (4 December), the Pagan Winterfest (6 December) and an afternoon of Christmas Songs (15 December). Visitors to the museum can explore the world’s finest collection of football artefacts and archives. Whether you’re a die hard football fan, planning a visit with your family or on a weekend break to the great city of Manchester, enjoy a visit to the world’s biggest and best football museum. This year Tatton’s Christmas concerts cover a multitude of musical genres from classical to choral. Before enjoying the performances, visitors are welcome to walk through the decorated White Christmas Mansion and enjoy a warming winter drink. Pre-concert suppers are available in the Stables Restaurant and Gardeners’ Cottage. St. Ann’s Hospice Festival Choir sings Christmas music and carols with favourites for all to join in. Sing along to such classics as The Twelve Days of Christmas, It’s the Most Wonderful Time of the Year, Ding Dong Merrily on High! and Have Yourself a Merry Little Christmas. Times are hard for young Jack and his mother but when he is forced to sell his beloved cow for a few beans, Jack finds himself in a whole new world of thrills and adventure. Featuring everything you’ve come to expect from a traditional Coliseum panto – laughs galore, magnificent music and spectacular costumes. Get ready to be taken high above the clouds on a magical journey. War Horse is the powerful story of a young boy called Albert and his beloved horse, Joey, who has been requisitioned to fight for the English in World War I. Caught in enemy crossfire, Joey ends up serving on both sides during the war before landing in no man’s land, while Albert, not old enough to enlist, embarks on a treacherous mission to find his horse and bring him home. A remarkable tale of courage, loyalty and friendship, War Horse features ground-breaking puppetry work by South Africa’s Handspring Puppet Company, which brings breathing and galloping horses to life on stage. See the boy who never grows up in a live adventure you’ll never forget. Peter Pan, The Never Ending Story World Arena Tour is a high-flying, hi-tech fantasy adventure that combines the drama and excitement of live theatre with the epic visuals of a blockbuster movie. Pinch yourself as you watch Peter Pan fly high above the stage without wires – a world first in theatre. Marvel at the spectacular scenery, brought to life by state-of-the-art digital imaging – Neverland like never before. The only ice rink in the city centre is returning to Hardman Square for another festive season. This year the whole estate will also be awash with Christmas activity, with late night shopping on The Avenue, letters to the North Pole, helter skelters and much, much, more! Deck the halls with LEGO® bricks – Christmas Bricktacular is coming to LEGOLAND® Discovery Centre! Enjoy a festive LEGO Factory Tour, sing Christmas karaoke with the LEGO Friends in Olivia’s House and create a merry masterpiece at the LEGO Master Model Builder workshop, where imaginations will be inspired by Christmas décor. Experience MINILAND® as you’ve never seen it before as the local area comes to life with LEGO Minifigures celebrating their own spectacular Mini-Christmas. Get ready for a ho ho ho-larious good time on one of the enchanting Santa Special Trains. A Christmas tradition for many in the North West, the Santa Special is back after a record breaking run last year. See the beautiful decorations on both the carriages and in the station, enjoy Christmas carols and live brass bands. There really is no better way to get into the festive spirit. Journey through the magical gardens, try out your lantern making skills, visit the Elephant House and Fruit Bat Forest, meet the friendly festive characters and sample some of the deliciously tasty treats. See the beautiful animal lanterns – with some ‘new arrivals’ created especially for this year’s event. Make your Christmas wish at the Giant Wishing Tree and keep the lanterns glowing. Together with the magnificent animals help Santa to light the way this Christmas. Christmas launches at Cheshire Oaks Designer Outlet on Thursday 14 November with the official lighting of the centre’s 90ft (Britain’s tallest) artificial Christmas tree, a continental Christmas market and a spectacular festive fireworks display. The day also marks the start of a fabulous shopping event with activities, promotions and extra special star buys on offer across the 145 stores at the centre, which will continue throughout the Christmas period. Even Father Christmas knows Manchester Arndale is the best place to pick up all the hottest pressies. So put your order in when he sets up in his brand new Christmas tree star grotto in Halle Square. Whether you need some stocking fillers, top-end designer gifts or speciality food and drink to make your festive occasions extra special, you will find it all at The Magical Christmas Fair. The Magical Christmas Fair is not just about buying gifts, it’s the perfect way to get into the Christmas spirit with live music, carols, bands and festive entertainment, plus a chance for kids to meet Santa and his friends in his candy cane grotto. This spectacular and magical event returns to create a traditional Christmas experience for all ages. Bigger and better for 2013, this four-day event will have the whole family feeling festive from top-to-toe. Completely free to enter, the market will feature more than 100 stalls selling the finest festive food, mulled wine and warm cider plus unique crafts and gifts. For a Truly Dickensian touch, a cast of jolly Victorian characters will be bringing the market to life and transporting you back in time. Located at the corner of Chapel Street and Victorian Bridge Street, Salford, Greengate Christmas Family Market is the perfect spot for families and shoppers to relax after a long day in the city. Within 2 minutes walk of Manchester Cathedral and the city centre, visitors to the market can enjoy this new public space with festive street performers, warming winter food and festive treats from the market traders. Children will also have a chance to meet Santa at Greengate Square, just before he drops down their chimneys. This entry was posted in Christmas, Events, Family, Food & Drink, News, Oldham, Shopping and tagged arndale grotto, bridgewater hall, cheshire oaks, Christmas, christmas in manchester, christmas markets, concerts, december, family, gifts, greengate market, john rylands library, lego discovery centre, manchester, national football museum, oldham coliseum, Peter Pan, phones4u arena, presents, spinningfields ice rink, tatton park, the lowry, things to do, War Horse on November 13, 2013 by Joshua Morgan.